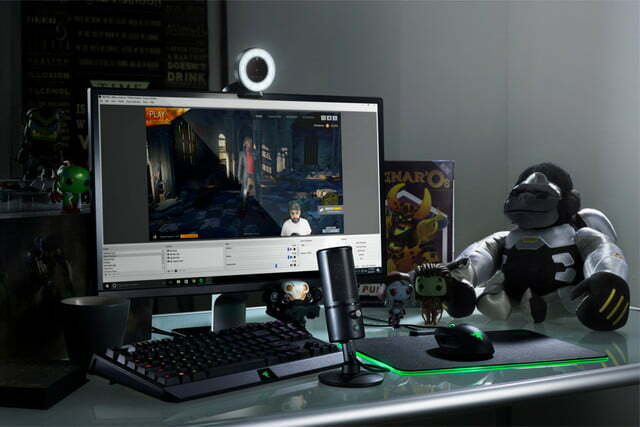 The Razer Kiyo is a streaming-focused webcam that takes sharp, vivid video and provides its own lighting in a great design. It’s hard to look good when streaming on Twitch or Mixer. The best streamers have studio setups with professional microphones, bright lighting and, sometimes, even green screens. The new $99.99 Razer Kiyo tackles lighting by featuring a built-in ring light that lets you illuminate yourself without any extra equipment. It’s a big boon to image quality, and is both innovative and easy to use. Want to make your stream look good? Go with the Kiyo, especially in low light. The Razer Kiyo looks nothing like any other webcam I’ve ever seen. A giant light ring will do that. Despite the shape, it’s still the best-designed webcam I’ve ever seen. Every detail looks like it was meticulously thought out. When it’s closed, the Kiyo is a stack of three discs: the camera and light ring, a hinge with a grip that clutches the front of a monitor, and the rear hinge that squeezes tightly to the back of your monitor. It squeezed snugly to the laptops and desktop monitors I tested it with, and it’s just as solid as its chief competitors, the Logitech HD Webcam C920 and C922, both popular webcams among streamers and office users alike. The webcam is in the center of that top disc, surrounded by a thick, white, LED light ring and a dial to adjust how bright it gets. It’s noticeable, and far more conspicuous than other webcams. But it also serves a functional purpose. As with all cameras, a webcam’s biggest weaknesses appear in low-light shots. On the bottom of the lowest disc is a mount for brackets and tripods, for folks who’d rather not clamp it to a monitor. My only issue with the Kiyo’s design is the 4.9-foot braided USB 2.0 cable. It isn’t detachable, and it’s not as long as the ones from some competitors. Razer’s own Stargazer has a longer cable (8.2 feet, USB 3.0) that can be detached and easily replaced, and the Logitech C920 has a 6-foot cable, though it’s not detachable, either. Oh, and I’d be remiss not to mention Razer’s branding. The Razer brand name is right under the camera lens, but the three-headed snake is tucked away on the back of the first disc. If you’re not looking, you may not even notice it. Razer’s camera looks just as good as our favorite webcam, the Logitech C920, and its gaming version, the C922. The 4-megapixel, 2688 x 1520 camera takes colorful photos and video, especially in great light. And thanks to this camera’s 81.6-degree field of view, you might even be able to fit a friend into the shot. In our lab, which is filled with natural light, images and video I snapped looked awesome. My forest-green shirt was very close to the right shade, and my blue eyes looked better than on any other camera I’ve tested. Little details, like individual hairs in my beard, popped, and I could make out all the holes in our pegboard far behind me. When I did an exact comparison shot with the C920, I found that while my shirt was slightly truer with Logitech’s lens, my skin and eyes looked better on Razer’s webcam, and both offered great detail. Then, I took our Alienware 17 into a pitch-black room, lit only by the display, and turned on the light ring. Photo and video I took in there were surprisingly decent, considering the circumstances. My face was clear, thanks to a 5600k color temperature (the same as daylight), and the colors popped again. There was no visual noise on my face, though there was in the background. However, when I recorded some footage from Mass Effect: Andromeda(2017’s biggest disappointment) with OBS, that noise was far less noticeable because I was in a smaller box in the corner. Speaking of OBS, the camera supports any streaming software, though Razer specifically mentions OBS and XSplit. You can stream 1080p at 30 frames per second or 720p at 60 fps. The light is good in situations besides pitch-black darkness. My desk, for example, has some fluorescent lighting around it, but it’s far from optimal. 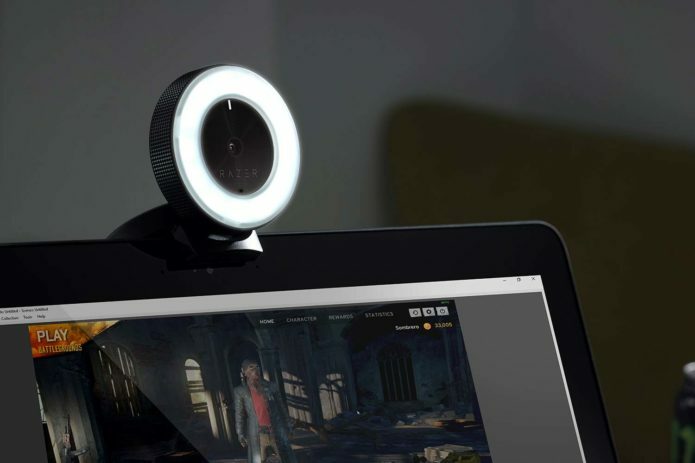 Two clicks of the light wheel provide a bit of extra light, which is great for a conference call or quick stream to Twitch. The only big issue I had is with the audio. The microphone isn’t amazing and leans toward the quiet side during playback. However, most gamers and streamers will use a headset or microphone (Razer would love for you to try its new Seiren X) on services like Twitch or Mixer, so it’s not the end of the world. But cheaper cameras, like Logitech’s, have better mics built in, so I wish Razer didn’t skimp on it here. Most of Razer’s PC peripherals connect with Synapse, its software to adjust settings and change colors. The Kiyo doesn’t do that. Razer explained to me that the Kiyo, as well as the Seiren microphone, were designed to be plug-and-play devices. For some setups, though, having some options in Synapse would really help. Particularly, it would be nice to have a software option to switch among the 12 light stages instead of having to twist the ring. I’d love for a future version to work with Chroma and adjust colors in Synapse for some special effects, but that’s wishful thinking for a future iteration. The Razer Kiyo is one of the most thoughtfully designed peripherals I’ve ever seen. It fulfills a need, but takes it to the next level by adding professional features without tacking on a higher price tag. A single light ring (albeit a very good one) isn’t the same as a full setup, but it brings something more like a studio to a lot of people. The price may be a sticking point for some people. At $99.99, it’s the same price as Logitech’s C922 streaming camera. But the C920, which is also popular among streamers for its wonderful image quality, can be had online for as low as $55 (far less than its $80 MSRP). It doesn’t have the lights, but its microphones are better and its photo and video quality are stunning. If you don’t need the light, it’s a great buy as an all-around daily driver. But for something dedicated specifically to streaming, the Kiyo is a winner. It will add to anyone’s production value, and make them look great. I wish it had a detachable cable and a better microphone, but at least the latter can be resolved with a headset. If you want a great image and strong, vibrant lighting, you can’t go wrong with the Kiyo.